The hotels on this page are guest friendly hotels (also known as bar girl and joiner friendly hotels) in Pattaya. What “guest friendly” means is, the hotel allows you to take a guest back to your room free of charge. If you’re a single man visiting Pattaya for nightlife and girls, these hotels allow you to take girls to your room overnight without paying a joiner fee. Considering the price of bar girls in Pattaya, joiner fees are one more expense you can do without. Here’s a little more information about joiner policies and fees. This post contains affiliate links, meaning, if you click on a link and make a booking (within 24 hours for Agoda), I earn commission, at zero cost to you. Thanks for your support. You can read my disclosure here. Where are these guest friendly hotels? As per the map (below) these hotels are in downtown Pattaya, between North Pattaya Road and the southern end of Walking Street. The best and most popular areas to choose a guest friendly hotel in Pattaya. If you arrived on this page after clicking on a link to guest friendly hotels in another area of Pattaya, sorry, I deleted those pages and merged the more important ones with this page. DISCLAIMER: I can’t guarantee a hotel has not changed it’s joiner policy since I last emailed them. So I do recommend you contact the hotel for your own peace of mind. You can either send them an email or contact them through the Agoda message service. You must book the room for 2 occupants, that’s you and your guest/s, price for single and double occupancy is the same in any case. Your guest must be at least 18 years old, the age of sexual consent in Thailand, some hotels require your guest be older, up to 21 years old. Your guest will also need to report to the front desk with their ID card or passport. When it comes to choosing a hotel, reviews are you best friend. You can learn a lot about a hotel from reading reviews – including the quality of service, friendly or unfriendly staff, room problems, noise problems, location problems, food quality, or even the comfort and quality of the bed. Most of the rates shown on this page are high season rates. 1 click on the links will show the current rate, minus taxes. That’s the date I first contacted the hotel. I often remove a hotel from the page and replace it with a recently “reconfirmed guest friendly” hotel, let’s call it a rotation system, lol. That’s the last date I contacted the hotel. In some cases it might be months ago, things can change in that time, that’s why I urge you to contact the hotel yourself. In Thailand? you can book and pay for any hotel without a credit card via 7-Eleven counter service when you book with Agoda. Get the best hotel deals: Choose your hotel then use HotelsCombined to compare prices. In this area: Sabai Land, Soi 6, Terminal 21, Tiffany’s. Distances: North Road to Central Road is 1.40 kilometers. 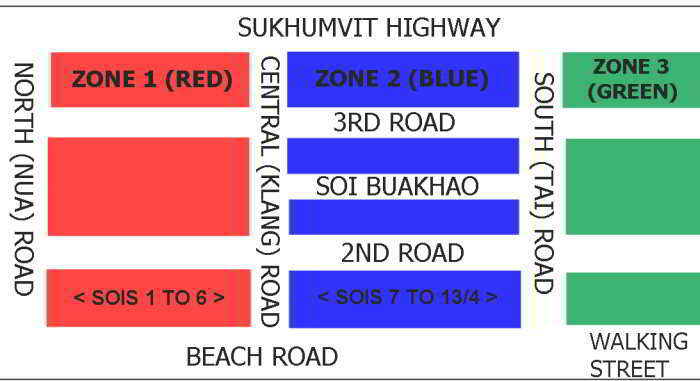 Beach Road to Sukhumvit is 2.10 kilometers. Reconfirmed guest friendly on March 26th 2019. Reconfirmed guest friendly on January 19th 2018. Added on January 27th 2017. Reconfirmed guest friendly on January 18th 2019. Corner of Soi 2 & 2nd Road. Reconfirmed Guest Friendly on March 26th 2018. Between 2nd Road and 3rd Road. Reconfirmed Guest Friendly on March 27th 2019. In this area: Central Beach mall, Royal Garden Plaza, The Avenue, Soi 7, Soi Buakhao, Soi LK Metro, Soi Honey, Soi Diana. Distances: Central Road to South Road is 1.45 kilometers. Reconfirmed Guest Friendly: November 20th 2018. Note: the policy above applies to all LK Group hotels. REMARKS: “Yes, If the guest check-in 1 person, Can bring 1 Joiner free of Charge. 2) Guest/Visitor/Joiner must leave hotel before 12:00 (noon) Free of charge. Reconfirmed Guest Friendly on March 11th 2019. Soi 13/4, between Beach Road and second Road. There’s actually a great story on the blog about the history of The Classroom. Above Shooters Coyote Bar, Soi 7. Reconfirmed Guest Friendly on April 14th 2019. Reconfirmed Guest Friendly: January 18th 2019. Reconfirmed Guest Friendly on April 11th 2019. Soi 24, South Pattaya Road. Added on February 7th 2018. Added on: October 19th 2016. Reconfirmed Guest Friendly on March 12th 2019. Third (3rd) Road, 60 meters from Soi Lengkee. Reconfirmed Guest Friendly on February 8th 2019. In this area: Walking Street, Beer Garden, Bali Hai Pier. Distances: South Road to the end of Walking Street (Bali Hai) is 780 meters. Walking Street to Sukhumvit is 2.70 kilometers. Stick around and have a read of the blog, here’s a few posts you might find useful.